Allen is a technical evangelist, he’s here to talk about building native Windows 8 Apps with HTML. He emphasizes that Windows 8 makes Touch and the Windows Store first-class citizens. Nice detail: you can set up a visual gesture password by picking regions in a photo. In his case, he presses his son’s nose, then his daughter’s nose, then draws a line between them. Slick. Using their WinJS library, you can get access to all the Metro styled controls and widgets. Using the Windows JS library, you get access to all the Windows device API’s. Caridy describes how Yahoo! built Axis on three different platforms using Mojito. He talked a lot about lessons learned while building a complex UX on iOS, Android, and Chrome desktop. 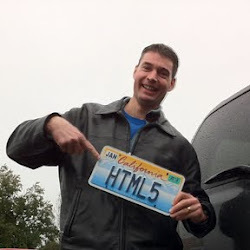 Axis has to solve this question — how do you produce the right HTML, JS, CS per runtime and per request? To solve it, sometimes JS runs in browser, sometimes on server. Other times there are “Native Bridges” for iOS and Android. Adaptation in Mojito reacts to screen size, connection speed, feature detection, and so forth. YUI helps considerably with such adaptation. Does it scale for screen resolutions? Does it support touch inputs? * For mobile, you have to pre-render tile backgrounds, conserve Canvas drawing calls, and make small binaries for sounds and images. * You only get access to four touch events on most devices right now. See Boris Smus’s pointer.js as a nice abstraction layer. Enhance your hit radius for touch to make it easier to touch your target. * Scrolling is really hard. You need a library like Swipe.js or iScroll to give you the momentum and friction physics that you get on iPhone. Of course, David thinks Sencha Touch is the best; he’s biased, since he spent months working on scrolling as part of the Sencha team. (Note: unfortunately, Sencha doesn’t support Gecko). * Beware of measuring distances in pixels. Retina displays automagically compensate when you use pixel units in CSS, Android does not. * Read the user interface guidelines for iOS, Windows Metro, Android. For example, iOS uses Sheets where Android uses Overlays. Standard icons for stuff like Reply, Trash, Bookmarks, Back are all different. Try to follow the platform-specific conventions (i. e., don’t be a tourist) and leverage the universal stuff. * Buy some devices! Hold onto your old phones, use them for testing. Don’t upgrade the iOS on your old phones, it’s hard to go back. Buy old phones from your friends. Pay to attend Google I/O. * Lots of mobile interfaces are heading towards type-based minimalist interfaces while iOS becomes elaborate and skeuomorphic. For example, the iOS Address Book interface makes non-geek users comfortable right away. The minimalist interfaces seem like they’ll be a lot more portable, but for complex desktop Apps it may not scale up to having toolbars with 40 icons. * Use CSS to give yourself various fallback positions for fonts, backgrounds [but beware the performance hit of fancy CSS]. * Sometimes, you just have to use User Agent detection (followed by tagging DOM with platform-based classes and then fixing it all in CSS). * Learn about real-time connectivity options, including cross-document messaging using postMessage, XMLHttpRequest level 2, Server-sent Events, WebSockets, and even WebRTC. I recommend this great essay by Jeff Atwood about the horribleness of PHP and what to do about it. I first encountered PHP when I did the second implementation of birdwalker.com, my website for birding field notes and photos. I did the first version entirely in XML and XSLT. It was a contrarian choice for building an entire website, but it did force me to learn XSLT well enough to be the go-to guy at work for XSLT questions. Compared to XSLT, writing birdwalker.com in PHP was a dream — so fluid, so much ongoing feedback. Problem was, I looked up a year or two later and found SQL queries right smack in the middle of my presentation logic. Blech! John Lilly – Lessons From Mozilla: WordCamp San Francisco 2009. John lays out the state of the world from the Mozilla point of view back in 2009 with his usual clarity and humor. Highly recommended.